Just a quick reminder that the last time Tennessee beat Florida in football was the all way back in 2004, when Facebook had just launched and iPhones didn't even exist yet (for a full list of what has changed since then check out this crazy list by SB Nation). For the first time in years, however, Tennessee is favored by many to win this matchup. Talent-wise both these teams are incredible, but neither have looked overly impressive out of the gate. The Vols have struggled with Ohio and Appalachian State, while the Gators' offense has continued its annual tradition of struggling. Not helping the Gators is the fact that starting quarterback Luke Del Rio is out for this game, opening the door to Purdue transfer Austin Appleby. Appleby does have some experience, but the Tennessee defense is extremely talented, led by corner Cam Sutton, which could give the backup quarterback some serious issues. Tennessee also brings a talented and athletic front seven to the equation, which could give the Gators' inconsistent rushing attack some issues. The Gators will need a big day from Antonio Callaway, who come on to the scene in a big way in this game a season ago. 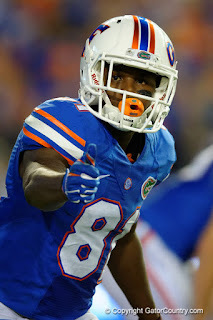 Callaway, a true sophomore receiver, is one of the few weapons UF possesses on the perimeter. The key for Tennessee in this game will be their offense, which has been disappointing throughout much of the new season. Behind Jalen Hurd and Alvin Kamara, the Vols have run the ball well, but senior QB Joshua Dobbs has been unable to find any rhythm through the air. Florida's secondary, led by future NFL corner Jalen Tabor, is superb, meaning that Tennessee could struggle through the air once more. This game certainly looks like a typical, low-scoring, grind-it-out SEC football game. Florida has been amazing at finding ways to win in this rivalry, but I'm not sure if they can overcome the fact a backup QB is going into a hostile environment against a great defense. Iowa's loss to FCS power North Dakota State opened the door for Wisconsin to be the clear-cut favorite in the Big Ten West, but they have to get past a tough Michigan State team first. Wisconsin will lean on their usual attack; running the ball, quick passes, and tough defense. The passing game will have to stretch Michigan State's defense vertically, to open up the ground attack with the talent the Spartans have in their front seven. That front seven includes future NFL defensive linemen Malik McDowell and Riley Bullough, who should be able to keep the Badgers at bay. That should put more pressure on a Wisconsin defense that has performed wonderfully to this point. This same defense held Leonard Fournette to a mediocre day, and has looked dominant against Georgia State and Akron, so they won't be intimidated at all by the Spartans. Michigan State will hand the ball off often to their workhorse, L.J. Scott, and also rely on a passing game that isn't very dangerous, but can move the ball. Senior quarterback Tyler O'Conner has done a terrific job taking over for long-time starter Connor Cook, and he'll play a pivotal role in this one. An interesting aspect to watch of this game will be Wisconsin's mindset. Head coach Paul Chryst keeps his players as focused as anyone, but there is a chance the Badgers could be looking ahead to a schedule that gets absolutely brutal after this point, with Michigan and Ohio State up next. In a battle of two evenly matched teams that play a similar, physical brand of football, I think it could come down to which passing game succeeds more. Considering they are at home and O'Conner looked great against Notre Dame last weekend, I'll give the benefit of the doubt to MSU. With their victories over USC and Ole Miss, one thing appears clear in the SEC West: Alabama is the team to beat. However, that doesn't mean the Tide are invincible, and a number of other teams in the division are coming after them, mainly these two teams. For the third consecutive season, Texas A&M has opened up the season on fire, but they are hoping it doesn't end like the last two, where they fell apart in the second half of the year. Oklahoma transfer Trevor Knight has played well, not turning the ball over and making the right decisions. Knight doesn't have the raw talent of past Kevin Sumlin-quarterback projects like Johnny Manziel or Kenny Hill, but fits the offense just as well. Also helping out the signal-caller has been the emergence of a dangerous Aggies' rushing attack, propelled by explosive Trayveon Williams. Add in lethal receivers Josh Reynolds and Christian Kirk, Texas A&M will do what they always do: put up plenty of points. A&M's defense has improved the last few years under the leadership of defensive coordinator John Chavis, and so far it has looked terrific in '16. They'll have to keep it up against an Arkansas offense that won't put up points in a hurry, but will utilize a strong, power run game. That run game is led by Rawleigh Williams, which has had major success running behind Arkansas' massive offensive line. That O-Line will not only play a pivotal role in providing lanes for the ground game to work, but also in containing one of the most dominant players in college football. Texas A&M defensive end Myles Garrett is considered a prime candidate for the No. 1 pick in the 2017 NFL Draft, and he has looked great early this season, despite facing constant double teams. The Razorbacks will also obviously need some production from an average passing game, which needs a lot from first-year starter Austin Allen. Allen will need to play disciplined and smart, as the Aggies' secondary has a ton of ball-hawking defensive backs roaming around. Texas A&M has fooled plenty of people with their hot starts the last two years, but I think they are for real this season. As long as they don't turn the ball over and contain Arkansas on the ground, the should be able to get the job done.